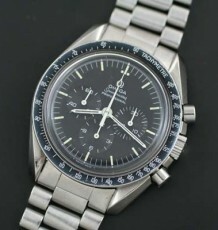 Rare oversized Omega Aviators watch. 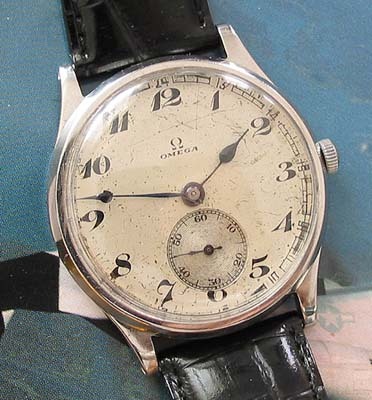 Very unusual oversized Omega wristwatch produced in the later part of the 1920’s (based on the movement serial number). 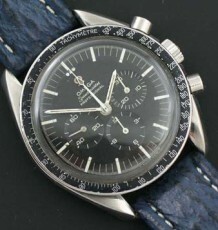 The predominant use for oversized wristwatches during that period was for the new sport of Aviation. Of particular note is the striking similarity to the Royal Air Force, Air Ministry design commissioned almost a decade later. 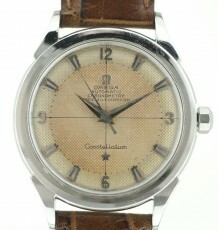 The original dial has some wear marks to it, primarily due to a lost crystal prior to repair. As the dial is still quite presentable I have elected to preserve the authenticity of the piece. The oversized spade hands are also orignal to the watch. The Omega calibre 26.5 movement was just serviced and keeps excellent time. 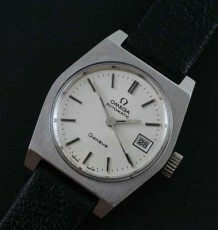 The Oversized Omega signed stainless steel case, measures 37.5mm wide by 43mm long. The watch is supplied on a new black leather croco grain strap.